Hey everyone. I will be doing my weekly segment on SuperSport 930 in Jackson, Miss., on Friday morning. That extravaganza will begin around 8:05 a.m.
Not sure we have a ton of Auburn stuff to discuss, but our talks generally are chock full o' information. Hey everyone. One of the most complicated men every to wear an Auburn uniform, former baseball coach Steve Renfroe, has landed in the world of (top-level) high school baseball. He will coach at Briarwood Christian, which has an outstanding baseball program. Renfroe took over for Lee Hall, the former UAB assistant, who left to spend more time with his family. First off, Hall is one of the 10 best coaches I've ever seen. I hope he resurfaces around here soon. As for Renfroe, he is a very good man who is very bad at managing scrutiny. I enjoyed so many swell conversations with him during his tenure under Hal Baird. Once Renfroe became the figurehead after the 2000 season, though, he slowly became a completely different person. He seemed unhappy, paranoid, argumentative and miserable. That affected his relationship with the players and everything fell apart. He was fired after the 2004 season and has been out of the spotlight since then. I hope Renfroe finds Briarwood more to his liking. The guy can coach. Hey everyone. 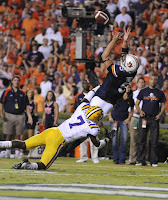 Thomas "Tommy" Trott, formerly of Trinity Presbyterian fame, has been added to the John Mackey Award watch list. The award is given annually to the nation's top collegiate tight end. Trott, a senior, has 34 career receptions for 330 yards and a pair of touchdowns. He has played in 39 career games and started 22 of them. Thirty players were named to the watch list. Hey everyone. I'm mired, and soon will be mired even more heavily, in busywork. So all I have to offer right now is a blank thread. Make it special. 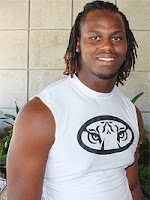 DL Kenneth Carter of Greenville High has made a verbal commitment to play tackle football at Auburn beginning in 2010. We know this because our friends at AuburnSports.com, AuburnUndercover.com and ITAT say so. Carter stands 6-foot-5 and weighs approximately 270 pounds. He was a late bloomer in a sense -- ie wasn't a game-changing element until 2008 -- and only recently began receiving offers from big schools. We know Ole Miss, Kentucky and Southern Miss are highly interested. ITAT believes Alabama and Clemson, among others, have offered scholarships. Both Scout.com and Rivals.com rate Carter as a three-star prospect (out of five). OL Shon Coleman, Olive Branch, Miss. ATH Shaun Kitchens, Atlanta, Ga.
K Cody Parkey, Jupiter, Fla.
LB Jessel Curry, Buford, Ga.
CB Jonathan Mincy, Decatur, Ga.
S Demetruce McNeal, College Park, Ga.
WR Antonio Goodwin, Atlanta, Ga.
Hey everyone. Here's a short note to let you know that the Southeastern Conference and the Georgia Dome have extended their contract for the league's football championship game. The SEC now is contractually obligated to play in Atlanta through 2015. That seems fine to me. Atlanta is somewhat centrally located and the dome, while not exactly state-of-the-art anymore, is clean. It's also easily accessible via MARTA. Hey everyone. This is not Auburn-related. Underrated part of my job: Hearing the marching bands every week. I think Auburn has a swell band. They don't play anything real crazy, but they handle their business. Here is USC's band making me happy by playing Avenged Sevenfold's "Almost Easy." Brilliant.